Here's a feature I've been expecting ever since Google started to test rich snippets for pages that include reviews: showing movie ratings in IMDb's snippets. Now you can see the ratings without having to click on the search results, which is useful if you browse the web using a mobile phone or you want to check the ratings for a lot of movies. "Google tries to present users with the most useful and informative search results. The more information a search result snippet can provide, the easier it is for users to decide whether that page is relevant to their search. With rich snippets, webmasters with sites containing structured content—for example, review sites or business listings—can label their content to make it clear that each labeled piece of text represents a certain type of data: for example, a restaurant name, an address, or a rating," explains Google. 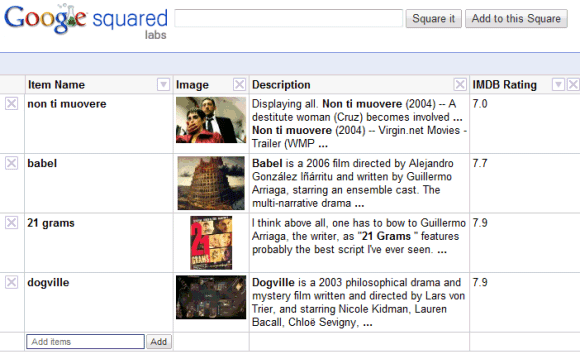 To quickly see the IMDb ratings for a list of movies, you can start with an empty Google Square, add the column "IMDb rating" and start entering movie titles. I've been wondering for a long time, how Google parses these info from sites like imdb.com? They also show number posts in a forum thread for a number of forums. Do Google have access to machine readable data from these sites or they just scrape pages? Just from scrapes of data from the sites. Its always a pain when the site in question changes design and the info is presented differently. Google usually extracts information from web pages automatically. That's how it obtains information like the number of posts in a forum thread, the authors of an academic paper (Google Scholar), table of contents for a book (Google Book Search). You'll find many errors, but at least it's a consistent approach and webmasters don't have to submit structured data. Recently, Google started to experiment with more reliable ways to obtain structured data from web pages: rich snippets (reviews, people profiles) that take advantage of microformats, RDFa, HTML5 microdata, specialized sitemaps for videos, products, geo content. IMDb doesn't use microformats or other formats for structuring data, so it's likely that Google extracts the information automatically. Here's an example of extraction error in Google Scholar. Google says that the authors of the first paper are: "IS Workflow, P Access, WHW ERM, W Innovative", but that's a mistake. The title of the paper is "Improving Staff Workflow and Patron Access" and Google's algorithm decided that Improving Staff Workflow (IS Workflow) and Patron Access (P Access) are actually two authors. Great finding Alex. Thanks for the info. IPL Schedule 2018 In the 2016 season, Sony's broadcasts achieved just over 1 billion impressions (television viewership in thousands), jumping to 1.25 billion the following year. RCB could even be pondering over famous brands Yuzvendra Chahal, who's a popular of Kohli, and India batsman Kedar Jadhav. Much obliged to you for the sharing great learning and data its extremely accommodating and understanding.. as I have been searching for this data since long time.